with a design that synchronizes and matches with the surroundings. It is moderately easy to paint glass pieces. Wash the glass plate/bowl with soap water and sponge. Allow it to air dry and then give it a final wipe with alcohol to remove any residue. This also allows the paint to adhere better to the dish. Apply the glass paint undercoat and allow the undercoat to dry as per the directions of the glass paint manufacturer. Now decide on a design you want to paint on the plate/bowl. You can create your own design or use sticky stencils to imprint a design on your glass. 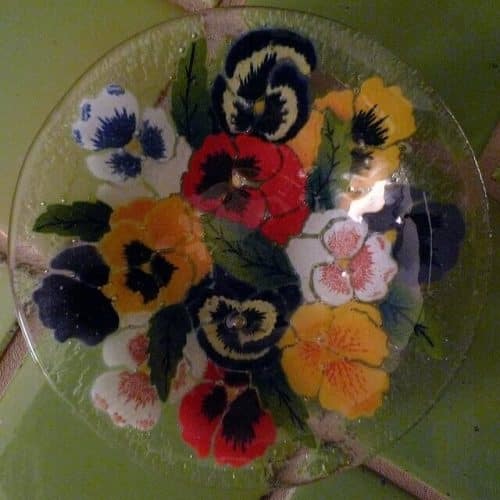 Depending on whether you use the stencil or draw free hand, use the sponge or paint brush to dab the colors on the glass bowl/plate. Wipe mistakes with a cloth dampened with alcohol. Carry on using different colors until your art design is complete. Allow the paint dry as per the directions. Apply a top coat if needed and allow it to completely dry before heat setting. Place the bowl/plate on a baking sheet and put it inside the oven. Allow the glass to bake for 30-45 minutes or as suggested, by setting the oven to 325 degree Fahrenheit. The bowl/plate is ready to use once it cools down. Do not mix the paint lines with each other as each has a different formulation and combination. Follow the instructions carefully for each paint product you select.